Although true that the successes of the past five years in the fight against metastatic melanoma can certainly be classified as historic, the disease is far from defeated. 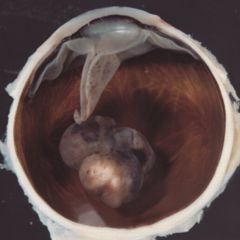 Therapeutic advances are however already there to see before our eyes, or looming on the horizon. 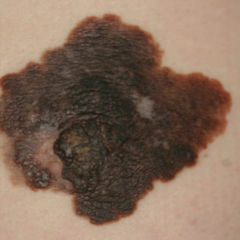 This malignant melanoma is among the most aggressive cancers. 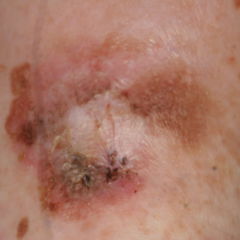 Patients who are afflicted by a metastatic melanoma survive untreated between six and nine months. In the last five years medications have been approved which enable significantly longer and better survival rates compared to less effective traditional therapies. These novel preparations embody two principles of action: immunotherapeutics (ipilimumab, nivolumab among others) activate the body’s immune system against tumours via blockade-inhibiting T-cell receptors. Signalling modulators (vemurafenib. trametinib among others) intervene in a regulating manner in disfunctional molecular transduction sequence pathways of the cellular cycle which contribute to tumorigenesis. Despite these breakthroughs, response rates, side effects and average survival periods are still not satisfactory with use of these agents. Improvements make themselves evident through combination therapies, as well as through more individually-adjusted treatments, these cases yielding the first promising successes. Additional operational and therapeutic principles could in the medium and long term enhance the spectrum of healing options. Some tumours make use of inhibitory receptors on T-cells in order to dampen the immune response to cancer cells. Progress in immunotherapy to combat malignant melanoma is in particular based on the strategy of blocking these “checkpoint” inhibitors by way of monoclonal antibodies, thus relaunching the disabled tumour immune response. It stands to reason that differing immunotherapeutic agents be tested in combination, since these have different points of action: At an early stage of T-cell activation, CTLA-4 blockers such as ipilimumab and tremelimumab yield response rates of around 15 percent. At a later stage, inhibitors of the PD-1-PD-L1 path such as nivolumab. pidilizumab and pembrolizumab achieve response rates of up to 30 percent and with fewer side effects. In one phase I evaluation of ipilimumab and nivolumab involving 53 patients there was a response rate of 40 percent, with another 40 patients the response rate was 39 percent. 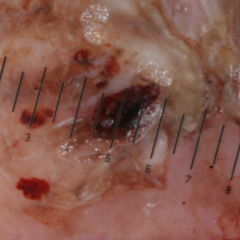 This was accompanied by a reduction in tumour size of more than 80 percent. Unfortunately, about half of the patients suffered from level 3 to 4 toxic side effects, which were only partially able to be overcome. One ongoing phase III trial compares nivolumab vs. ipilimumab vs. ipilimumab and nivolumab. Other planned or ongoing trials are testing combinations of immunotherapeutics synchronously and sequentially, as well as combinations of immunotherapeutics and pathway modulators. In melanoma disease the molecular transduction pathway MAPK (mitogen-activated protein kinase) is often overactive in its cascade function, signalling cell division by conveying a message from the cell surface to the cell interior. In about half of melanomas the BRAF protein in the MAPK pathway is mutated. The mutation (predominantly to BRAF V600E) has the effect that cell division is also stimulated without external growth signals. New pharmaceutics block the dysregulated signaling pathway. Here also, it is tempting to try out combinations, since the agents involved have different points of action: BRAF blockers such as vemurafenib and dabrafenib directly inhibit the mutated, overactive BRAF kinase. MEK-blockers such as trametinib on the other hand inhibit MEK, a protein further downstream along the MAPK signalling pathway. BRAF and MEK blockers are effective therapeutic agents, provided that the oncogenic BRAF mutation is actually present. MEK-blockers according to recent studies appear to act even with NRAS mutations present (possibly also with other mutations upstream in the signal path). Monotherapy using a BRAF-blocker is relatively well tolerated in general, despite a few unpleasant side effects. However, in almost all patients resistance develops after about half a year of improvement and remission, so that the disease progresses again. New mutations which come into the picture, reactivating the blocked MAPK pathway, are responsible for this at least in part. It may also be that excitation of molecular bypass cascade plays a role. Combinations of BRAF and MEK-blockers significantly improved response rates[Paywall] (ORR), progression free survival period (PFS) and overall survival (OS) compared to the single substances, but only together and not in sequence. In one randomised clinical phase II trial the combination dabrafenib and trametinib proved itself superior to monotherapy using dabrafenib (ORR: 76% vs. 54 %; median PFS: 9.4 vs. 5.8 months). Based on this result, the combination tested in 2014 was swiftly approved by the FDA. A phase III trial confirmed the effect of the combination in terms of ORR, PFS and OS as well. What’s more, in further combination vs mono comparisons the combinations constantly proved themselves to be better. These studies clearly promote combined BRAF and MEK-blockers as a new standard therapy for melanoma patients with BRAF-V600 mutation. Recently, this dabrafenib and trametinib combination was approved for the European Economic Area. Given the diversity of individual responses, biomarkers are urgently needed which predict with certainty whether and how a patient will respond to different therapies. There are already various rules that help. For instance: high lactate hydrogenase values, visceral diseases and low lymphocyte levels reduce the likelihood of responding to ipilimumab and IL-2. The expression of PD-L1 in tumours seems to correlate with a response to nivolumab and pembrolizumab. An important step towards greater precision was achieved in a recently published study involving 64 patients treated with CTLA-4 blockers (ipilimumab or tremelimumab). Following sequencing of tumour and somatic exomes, tumour-specific mutations were ascertained for each patient. Greater treatment success was associated with high numbers of mutations, but this factor alone is not enough. What appears to be decisive in the pharmaceutic achieving its effect is a specific pattern being present – a neoantigen “fingerprint”. This “fingerprint” was found in a first group of responders and confirmed in a second group. Neoantigen peptides activated lymphocytes in ipilimumab-treated patients. The results outline a genetic basis, based on which the effectiveness of CTLA-4 blockers may be predicted. Another success along the path to personalised therapy: under the auspices of the Cancer Genome Atlas four melanoma subtypes were able to be genetically identified, these being named according to their mutation status: BRAF, RAS, NF1, Triple-WT. A pilot experiment [Paywall] recently succeeded in inducing an immune response to cancer through vaccination. Researchers first sequenced tumour and somatic exome from three patients with metastatic melanoma, in order to track down the tumour-specific neoantigens. They then identified, using an algorithm for each patient’s tumour, specific proteins which would probably be best suited to attacking the immune system. Seven of these proteins were finally selected and synthesised. Patients were vaccinated using dendritic cells which presented these proteins as antigens. There was a specific activation of cytotoxic T cells against some of the neoantigens, with a peak in the eighth and ninth weeks after vaccination. The great hope is that, in this way, the immune response to the cancer can be effectively strengthened. Viruses against cancer – what still appeared to many until recently to be a fascinating scientific idea, but for clinics something utopic, now appears to be forging its way into application. 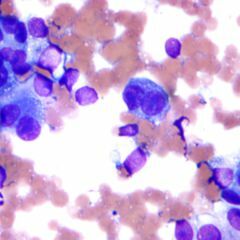 With respect to advanced melanoma, a recently completed phase III clinical study delivered news full of hope: using the virus immunotherapeutic agent talimogen laherparepvec (T-VEC), a significantly higher response rate occurred when compared to GM-CSF (granulocyte-macrophage colony-stimulating factor), with a remission rate of 16.3% (GM-CSF: 2.1%) as well as a – albeit statistically non-significant – rend toward prolonged overall survival (T-VEC: 23.3 months; GM-CSF: 18.3 months). Among responders there were nearly 40 percent who had complete remissions. T-VEC is a genetically engineered Herpes virus and is injected locally into the tumour tissue. It is supposed to fight the cancer via two mechanisms: firstly, through selective replication in tumour cells leading to their destruction, secondly via stimulation of the immune system through constructed GM-CSF. The side effects themselves are overall only relatively weak. Patients who do not respond to other treatments could benefit from the viral medical agent that is now being tested in combination with checkpoint inhibitors. Approval in the US and EU has been requested. Results from studies on epigenetic mechanisms in malignant melanoma, as well as those on the use of nanoparticles as vehicles for medications and many more, hold a great deal of promise. With regard to market access, there is a lot going on as well. Take for instance the recent approval of the PD-1 antibody KEYTRUDA (pembrolizumab) for the treatment of advanced melanoma in the European Economic Area. The future holds hope for further progress.